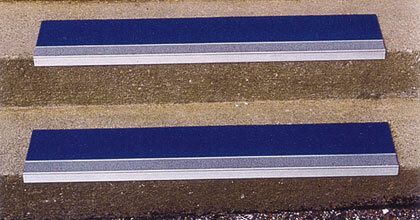 Aluminum Stair Treads designed for outdoor use. 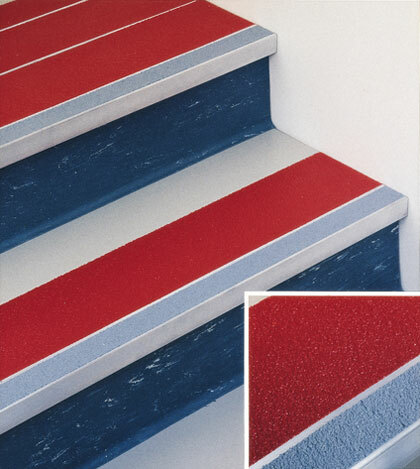 Heavy duty aluminum oxide abrasives combined with the latest technology polymeric binders are bonded to a high strength, heat treated aluminum stair tread. Available in 3 depth sizes; 7-1/2", 9" or 11"
Available in custom lengths of up to 10', call 330-650-5561 or email for quoting. Now also available are 3.5" and 5.5" filler plates, call 330-650-5561 or email for pricing. Standard two(2) countersunk holes every foot. 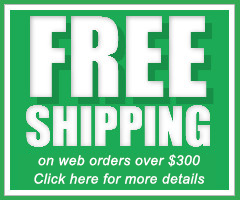 Call to place an order without holes for glue down installations. Production time on the GSA stair tread line is 4-5 weeks, please take this into consideration when working on a deadline.